The day after I created a new flag for the July 15th Solidarity March in Jerusalem, I learned that the Ministry of Education is requiring nursery school and kindergarten teachers to raise the Israeli flag every Sunday morning during the next school year. Many Israelis have no respect for the flag. Why should they? The flag is left out in the rain. Torn and tattered, it flies at night. There is no solemn folding ceremony. No right hand covers the heart; there is no pledge. I am all for flags and ceremonies because I grew up with them at public school in Ohio and summer camp in Maine. That is why I was dismayed to see how the Israeli flag was treated at the Sheikh Jarrah demonstrations over the past year. For months there were no flags at all at these demonstrations in the midst of an Arab neighborhood where Jewish settlers have taken over homes. But two weeks ago, the last time I went to demonstrate, Palestinian citizens of the neighborhood carried huge Palestinian flags. I thought it unfair that there were no Israeli flags and asked one of the organizers why. He explained that the Palestinians who live in Sheikh Jarrah associate the Israeli flag with Occupation and Oppression and therefore, do not want Israel’s flag flying at a demonstration against the Occupation and Oppression which they organize, along with their Jewish Israeli partners. The right wing Jewish settlers in Sheikh Jarrah (as well as in the Moslem Quarter of the Old City and in Silwan) drape the Israeli flag from the roof to the ground of their occupied houses, lest anyone be mistaken who lives there. Still, when I demonstrate in Jerusalem, I demonstrate as an Israeli citizen and therefore I want to hold an Israeli flag. Why should only the right wing use the flag? I love Israel and I love flags. But I also love the idea that the two states of Palestine and Israel should live side by side, so yesterday I sewed two flags together. I should have used green thread for the seam, but alas, the idea came after I finished and I am lazy. 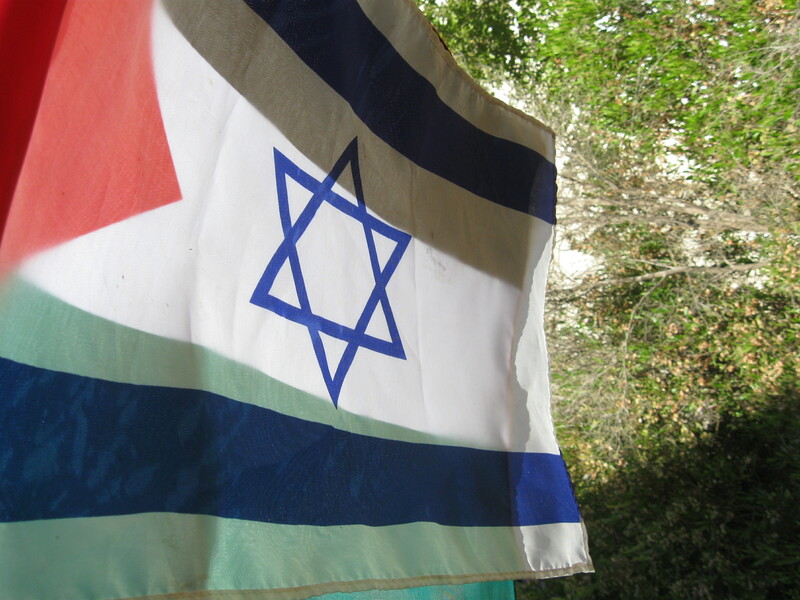 I plan to wave this hybrid flag at the July 15th demonstration when thousands, hopefully, march from the Jaffa Gate to Sheikh Jarrah. 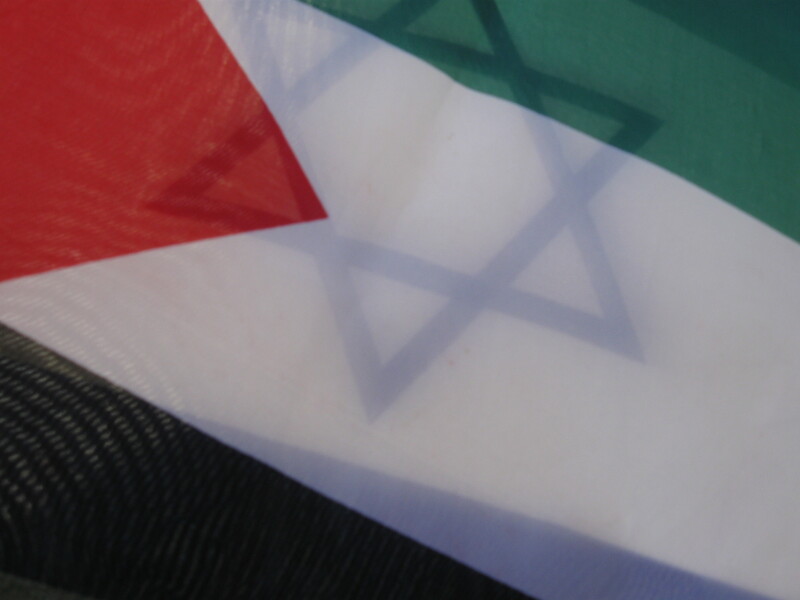 I hope demonstrators, be they Palestinians or Israelis, will not try to grab my flag from me. We have to get used to the two flags side by side, I will explain, before we can accept two states side by side. If the Ministry of Education ever supplies flagpoles, I hope the nursery school and kindergaren teachers will take Netanyahu’s acceptance of the two-state solution to heart and raise both flags–ours and theirs–and then teach the little children that one people’s happiness depends on that of their neighbors. This entry was posted in Israel, Palestine and tagged Israeli flag, Palestinian flag, Sheikh Jarrah, Solidarity. Bookmark the permalink. I hope to see you at the march.